When I am having friends over who enjoy eating and drinking, I like to start around 4:00 PM so that we can take our time over the course of the late afternoon and evening. This time was no exception; there were 5 of us and eight bottles of great wine. We did not finish eating and drinking until after 10:30. As customary, we started with champagne. Delamotte Brut Blanc De Blancs 1999 Le Mesnil –sur-Oger 100% Chardonnay. The wine was disgorged in 2007. It is elegant, complex medium bodied champagne with fresh citrus flavors and aromas, hints of ginger and a touch of almonds. Delamotte is the sister house of Salon. 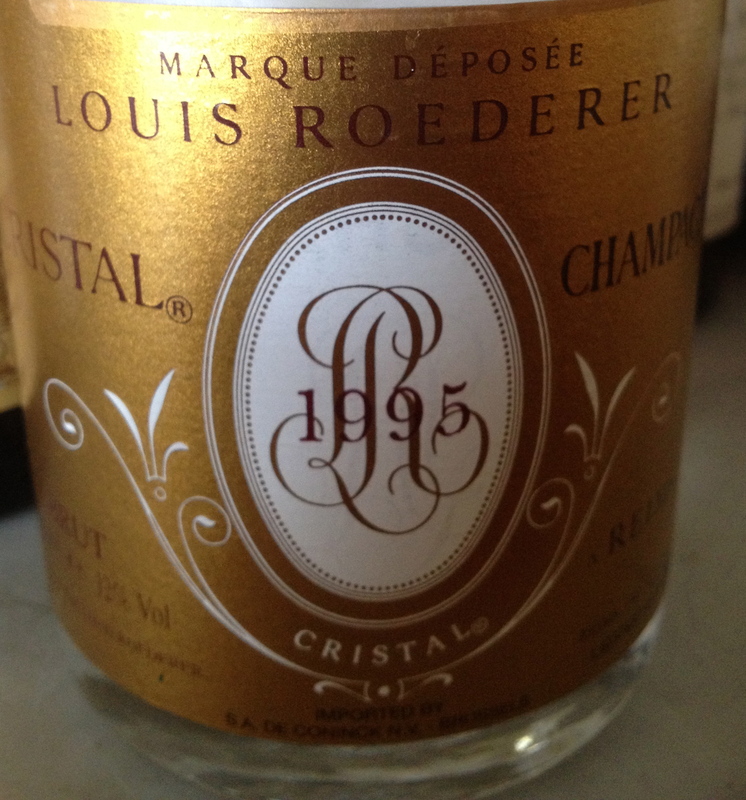 Louis Roederer Cristal Brut Prestige Cuvèe1995 Remis 55% Pinot Noir and 45% Chardonnay. Grapes are from Roederer’s own vineyards almost all of which are Grand Cru. It was showing no signs of age. It is a champagne that when you are drinking it you cannot help to be impresses by its complexity, body, aromas and flavors. Domaine LEFLAIVE Puligny- Montrachet 2000 100% Chardonnay from seven different parcels. There is a long gentle pneumatic pressing, decanting over 24 hours, then racking and running the must into casks. Alcoholic fermentation takes place in oak casks 18% new. The wine is aged 12 months in oak casks and the 6 months in tanks before release. Homeopathic fining takes place and very light filtering if necessary. For a snack, Michele prepared a sour cream dip with smoked salmon and gougeres. 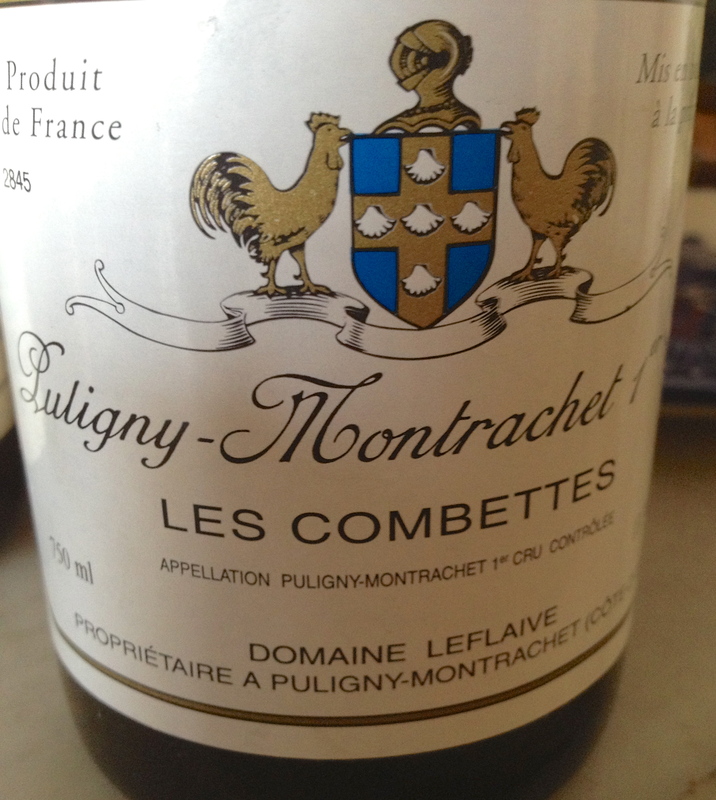 Domaine LEFLAIVE Puligny- Montrachet “Les Combettes”(1.8 acres) 2000, 100% Chardonnay. They do manual harvesting with grape selection. There is a long gentle pneumatic pressing, decanting over 24 hours, then racking and the must goes into casks. Alcoholic fermentation is in oak casks. 20% is new, 1/2 Vosges and 1/2 Alier for 12 months. The wine is aged 6 more months in tanks before it is bottled. It is interesting to compare the reguler wine with the cru. While they were both very good, in this case there was no mistaking which was the cru as it was a more complex wine intense aromas and flavors. Chablis Premier Cru “Monts Mains” 2000 Domaine François Raveneau á Chablis 100% Chardonnay. The grapes are gently pressed by a pneumatic press and only indigenous yeasts are used. The juice is left to settle and then racked off its lees into cuvee to ferment. Alcoholic fermentation lasts two weeks and malolactic fermentation takes place in barrels. The wine is aged for 18 months in old barrels and feuillette, a type of barrel (most made by the barrel-maker Chassin, only a small percentage of new barrels are used. This is a classic Chablis with nice fruit flavors and aromas, a touch of lemon and a hint of flint. 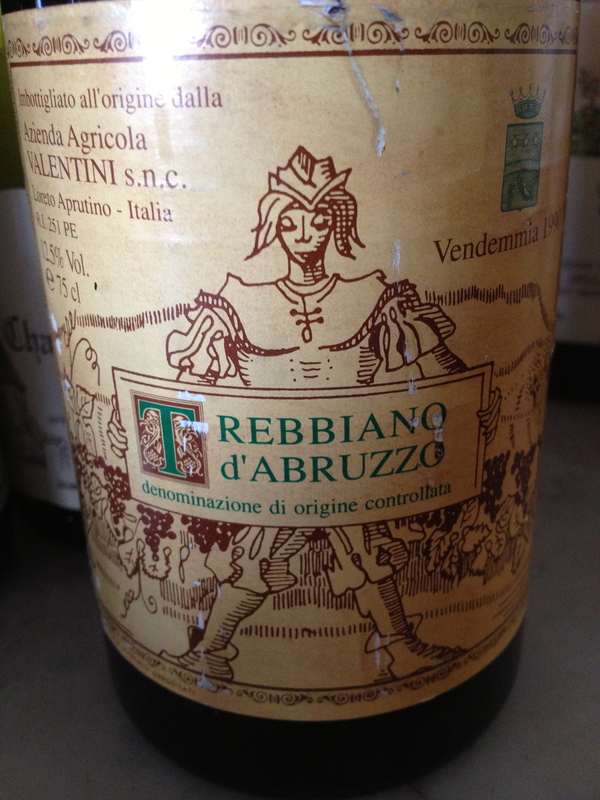 Trebbiano d’ Abruzzo 1990 Azienda Agricola Valentini 100% Trebbiano d’Abruzzo. The wine is aged in large botti of Slavonia oak for 24 months. This wine is very complex and full with a mineral character, hints of citrus fruit and apple, good acidity, great finish and aftertaste, with that extra something that is difficult to describe. It may be the best white wine made in Italy. It is a wine that can age for a very long time. Our first course was spaghetti Puttanesca, made with plump salted anchovies from Cetara. 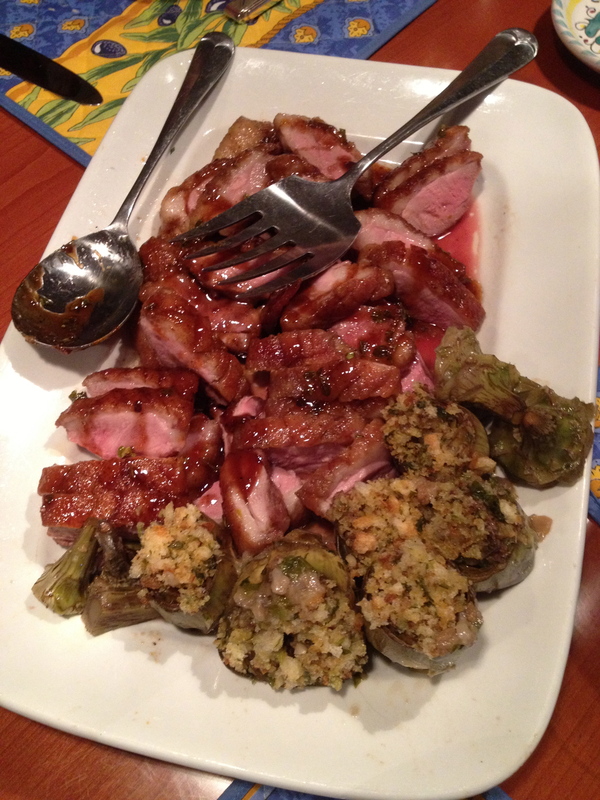 With the red wine we had glazed duck breasts. 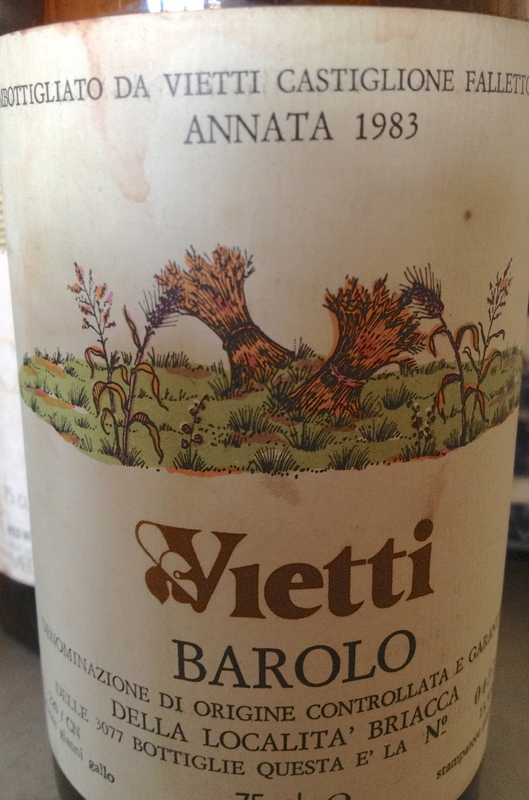 Barolo 1983 Vietti DOCG 100% Nebbiolo. 1983 was not a great year for Barolo but this particular bottle was showing very well. It was ready to drink but showing no signs of age. It had all the classic Nebbiolo aromas and flavors. 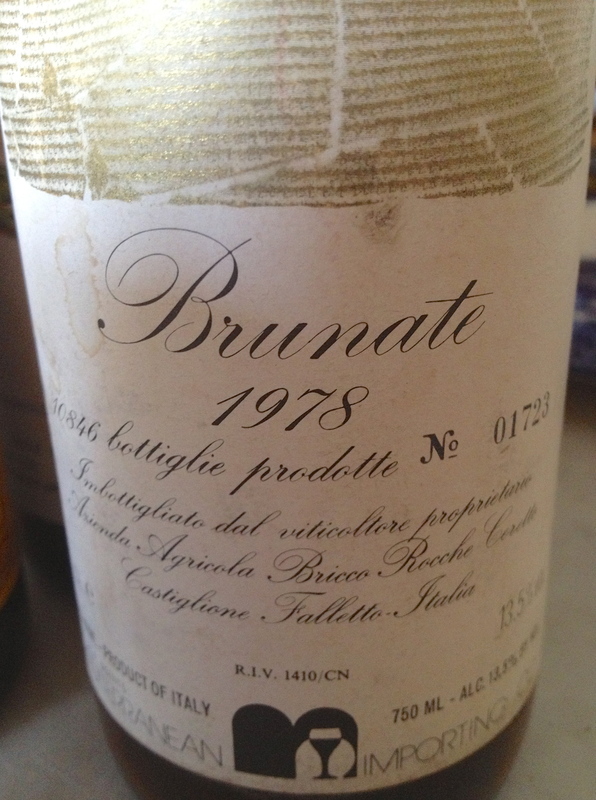 Barolo Brunate 1978 Azienda Agricola Bricco Rocche Ceretto. 1978 was a great year for Barolo but this particular bottle was showing some age. It was very drinkable but had some VA and a slight celery taste on the palate. The wine was helped by the duck. Delicious! Sounds like a beautiful evening! Interesting that you had a disappointing experience with an old Ceretto. Back in Alba, I tasted several older Cerettos, including the ’82, and I was across the board disappointed with how poorly they were aging: the ’82 was already tired and clearly finishing � much older than other wines of the same or older vintages that I had been tasting all week. I like the Cerettos personally, so I don’t want to publish and make a big fuss about this, but if I know anyone who has a lot of Ceretto in the cellar I’m urging them to drink them up sooner rather than later.